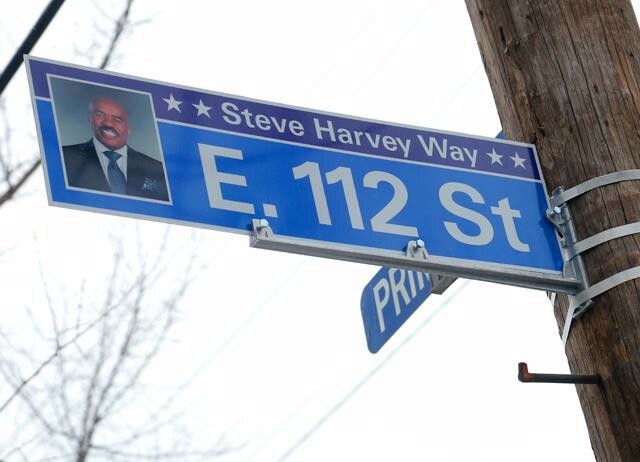 Cleveland Just Renamed E. 112th St. "Steve Harvey Way"
Cleveland just renamed E. 112th St. "Steve Harvey Way" to honor talk show host Steve Harvey. Harvey's a Cleveland native and grew up on E. 112. It's also his birthday tomorrow. Harvey will turn 58, so Mayor Frank Jackson, Councilman Kevin Conwell and members of the Steve Harvey show hosted a surprise re-dedication ceremony which will be broadcast during the show at 3 p.m. Friday. Via the city's Facebook page, "Steve Harvey spent his childhood days on East 112th Street in Cleveland and graduated from Glenville High School in 1974." Google Maps has yet to make the change.